Destiny would have turned her into a nonbeliever, but Krishna’s mercy saved her from the pitfall of impersonal atheism.I WROTE THAT I hate Jinnah!” said Ruth. It was 1984. We were in class ten, discussing our responses for the essay “A Recent Film You Saw.” We had all written on the film Gandhi. I had been greatly impressed by the film and inspired by Gandhi. But the strong statements my friends made goaded me to delve deeper into the freedom movement and decide whom to hate and whom to appreciate. After reading several books, I was no wiser in deciding whom I should hate. However, following Gandhi, I made changes to my lifestyle I began to sleep on the floor, I fasted on Ekadani, and I reached out to the poor and hungry. Up until then I had been a bundle of inferiority complexes. I was skinny and unimpressive, a failure at academics and a dull friend. Though I was learning music and dance, comments from friends attempting humor ate at my confidence in the arts as well. I was not happy at home, though nothing was particularly wrong there, and I yearned for love. My attempts to find that love in romance novels brought some relief but not enough. Now, introduced to Krishna, a natural attraction for Him arose, and with it, love. I was not new to religion. My parents were very pious. My mother would strictly perform her Siva japa every morning and celebrate all religious festivals grandly. My home resounded with classical songs and dance in praise of the divine. My maternal grandmother was also an extremely pious lady. With her eight children and her husband, she had walked the two thousand miles from Burma to India during World War II. By the time they arrived, three of her children and my grandfather had died. A year after my grandfather’s death, my grandmother, about thirty years old at the time, donned saffron robes, shaved her head, and engaged herself completely in spiritual activities. Reading Bhagavad-gita revived the religious feelings she and my family had instilled in me during my childhood. Two particular instructions from the Bhagavad-gita became part of my life. One was to do your duty without worrying about the result. This instruction drew me out of my selfconscious shell. Giving up fears and complexes, basking in the confidence of Krishna’s love, I took part in all the competitions and events at school. Whyn Because Krishna said not to worry about the results. Classes eleven and twelve were wonderful for that reason. I was always blissful and enthusiastic, and I even became a good performer in both academics and the arts. The other instruction was the yoga process taught in Chapter Six. Whenever I attended any spiritual program, I would sit with a straight back and concentrate on the tip of my nose with half-closed eyes. Once, I found my classmate Rita in a sad mood. Rita became a serious Christian. Several years later, she did me a good turn by bringing me back to devotion from the brief period of atheism into which I had ventured. Once, when one of my aunts visited our house, she brought a small part of the Mahabharata to read. This portion spoke of Lord Krishna’s friendship with the Pannavas. On hearing of Krishna’s friendship with His devotees, my attachment to Krishna grew even more. From treating Him as a boyfriend, I began to revere and pray to Him. My extremely religious geography teacher gave me a big calendar with a picture of Krishna playing His flute. This Krishna became my all-inall. I would even talk to the picture. I now had a very close friend. Once, I became afraid while riding my bicycle to my aunt’s house in the dark. I prayed to Krishna. When I reached my destination and parked my bicycle, a leaf that had fallen off a tree on the road reminded me of the leaf Krishna lies on at the time of universal dissolution. I felt assured that Lord Krishna had been with me during the ride. I used to have a terrible fear of ghosts. Once, when I was in the car park of our flats with my sister, it became dark and my own sister looked like a ghost. In fear I prayed to Krishna. Then, as I watched, my sister passed behind a concrete pillar, and when she came into view again, she looked like the form of Krishna I had seen in dances and dramas. I learned to see in others my friend Krishna, rather than an imaginary ghost. This helped me overcome my fear to a large extent. These two incidents and others like it helped me keep faith in Krishna, even when I was led into atheism by a group of Mayavadis, or impersonalists. I slipped into what I called healthy atheism. Mayavada philosophy encourages atheism: For the Mayavadi, neither the Lord nor the world exists. Nothing exists but Brahman, conceived of as impersonal by the Mayavadi. And if I asked something based on nastra, I was told, “Even nastra is false!” What can you speak or think when everything is falsen At least contrasted with regular atheists, Mayavadis attach great importance to the cultivation of celibacy, detachment from material enjoyment, and other sound values. At this point I was in my final year of college. I was given the assignment to find a topic outside of college and make a presentation on it. I was completely at a loss for a topic. My good friend Leela Pal Choudhury then extended an invitation. So one sunny afternoon, Leela and I dropped in at the ISKCON temple in T. Nagar, Chennai. We were taken to the room of the then temple president Gaõga Dasa, an Italian by birth. Gaõga Prabhu, as he was addressed, was patient as we poured forth our questions. I liked his analogy of a fish out of water to explain the condition of the jiva (soul) lost to spiritual life. I soaked up his words like a sponge. Unfortunately for Leela, I had no atheistic front to put up, as I was very happy to hear Gaõga Prabhu’s logical answers. I asked him why he had left Christianity to embrace Hindu culture. Then he discovered Krishna consciousness. The necessity to conduct interviews gave me the opportunity to speak to almost all the devotees in the temple and find out what had attracted them to ISKCON. Nimai Nitai Dasa, the head püjari (priest) of ISKCON Chennai, explained how he would visit ISKCON often simply because he liked the smell of the incense. Soon I met Lila Padma Devi Dasi, the wife of the then vice president, Radhika Ramana Dasa. I owe a lot to her for the extraordinary care she gave me to engage in Krishna consciousness. On her invitation, every Sunday I dropped in for three hours before the program and spent the afternoon with her, asking my never-ending questions. I read Srila Prabhupada’s books, hoping to find a question he couldn’t answer. But I realized that Srila Prabhupada had convincingly answered every question. I started chanting the Hare Krishna maha-mantra regularly. The greatest benefit I derived at first was relief from daydreaming. I was a heavy daydreamer. If I dreamed I was India’s President, I would continue the dream until I was cremated. My daydreams made me miserable. But now I would sing Hare Krishna as I went through the mechanical household chores. Peace and happiness filled me. Though I liked the philosophy of Krishna consciousness, along with the kirtana and prasadam, I was not ready to chant more than four rounds a day on my beads. And I chanted with absolutely no attention, as my ears would be drawn to the dialogues running on the TV in the other room. I tried reading Bhagavad-gita As It Is, but could not get past text 2.39, where Srila Prabhupada explains buddhi-yoga as Krishna consciousness. I just could not figure out how buddhi, or intelligence, could mean Krishna consciousness. Confused, I could read no further. I also made the colossal mistake of comparing translations by Chinmayananda and Chidbhavananda, which I had read earlier, with Srila Prabhupada’s. The differences made me want to tear my hair out. What made matters worse was the re-screening of Gandhi on TV. My heart again went out to Gandhi, who had placed me on the path of spirituality. Confusion reigned in my heart. As my mind reeled, my mother called me in for dinner. When I was finished, I picked up my plate to wash it, and my tongue automatically slipped into singing the Hare Krishna mantra. One day, His Holiness Jayapataka Swami visited ISKCON Chennai, where he has disciples. I listened to his arrival lecture. Later, after helping with services related to his dinner, I began to grind the batter for idlis. It was about 2:00 A.M. when I finally got to sleep. The next morning I was helping with the breakfast service when I heard the sound of Hare Krishna kirtana, and tears rolled from my eyes. I couldn’t understand what was happening to me. It seemed that my future guru was giving me a glimpse of the mountain of ecstasy available in the holy name. I had not yet spoken with him, but somehow, by his merciful glance, my consciousness had been purified. A few days later, for the third time I began reading Bhagavad-gita As It Is. This time I easily read past text 2.39. Gone was the obstacle of doubt caused by my ignorance and arrogance. And then one morning I woke at 3:30 A.M., feeling so fresh and bright that I immediately started chanting. On that day I began my practice of chanting sixteen rounds every day. By the causeless mercy of my guru, I was given the ability to read Srila Prabhupada’s books and chant the holy name. I could delve deeper into the process of Krishna consciousness instead of staying on a mental and intellectual level caused by my association with Mayavadis. My guru continues to help me in so many ways in my devotional service, and I am indebted to him forever. By the arrangement of senior devotees, I was wedded to Sumitra Krishna Dasa, and under his encouragement I am able to engage in several services for ISKCON. I was brought into the association of devotees, who showed me the path of pure devotion to Lord Krishna. The Srimad-Bhagavatam (3.33.7) says that a person practicing devotional service has in previous lives or this life performed all ritualistic acts, such as giving charity, visiting pilgrimage sites, and so on. I feel that in my early life I was taken on a tour of these things to confirm to me their inferiority in comparison to devotion to Lord Sri Krishna. Now I can be more determined in my practice in this lifetime and come closer to achieving the real goal of life. 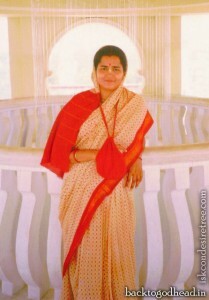 Tarini Radha Devi Dasi is a disciple of Jayapataka Swami. She is the mother of four children, and she coordinates children’s programs in Chennai. Her husband, Sumitra Krishna Dasa, is the temple president. Contact her at tariniradha@pamho. net.